... and finally on the underside of the sample. The next 3 photos show the progression of the different threads and tensions as I went through the trial process. 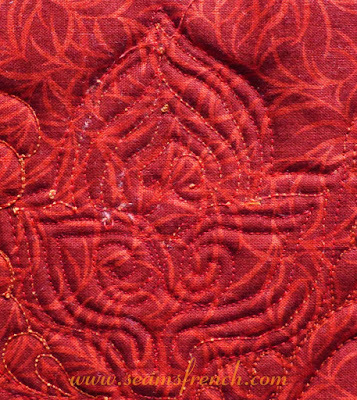 On the top side, the stitch was good with most variations (see below). 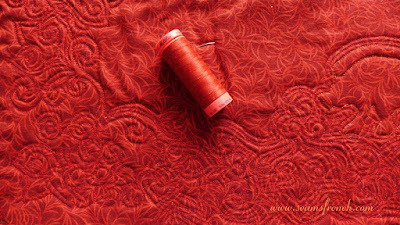 I prefer using a lighter weight thread, such as Aurifil, Superior's "So Fine" or a silk for the top thread and Superior's "Bottom Line" (a 60 wt. poly) in the bobbin. Superior's "Kimono silk", used for the bottom two petals of the center leaf, would have worked fine, but I didn't have the right colour nor the time frame to wait for an order. The underside was a very different story. 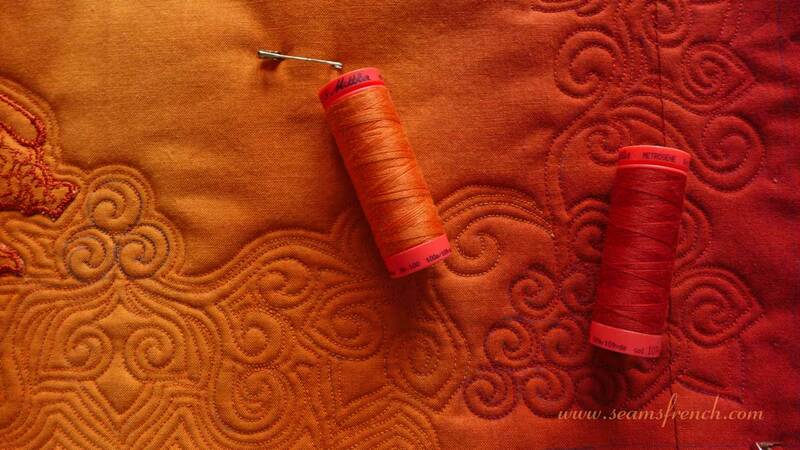 Because I like my threads to disappear into the fabric when quilting, I needed two very different colours for the top and the bobbin. 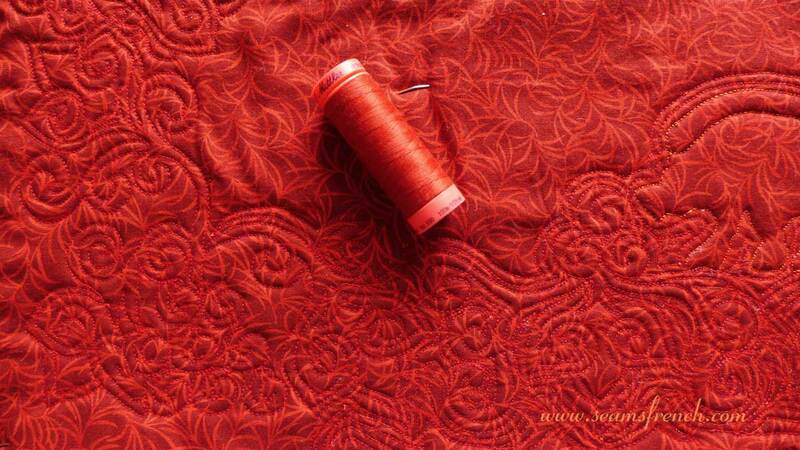 My normal bobbin thread for FMQ has been Superior's "Bottom Line", and that's what you see below. It balanced nicely with the silk thread, (the bottom 2 petals of the grape leaf). But the other top threads didn't fare well with the Bottom Line. Bobbin thread was consistent for the grape leaf. Top thread varied. So I played around with different threads in the bobbin, all with disappointing results. After much experimentation, frustration and tension, the left side of the feather on the sample below finally balanced with a plain old Guttermann 50 wt. poly in the bobbin. The bobbin tension also had to be seriously tightened, which made the hair on the back of my neck stand up on end, but I did it and it worked. I had settled on a "Mettler Metrosene" ( a 50 wt. polyester glide) on the top and the Guttermann 50 wt. poly in the bobbin. Yowzaa!!! Balance is finally achieved on the left side of the feather on the sample. 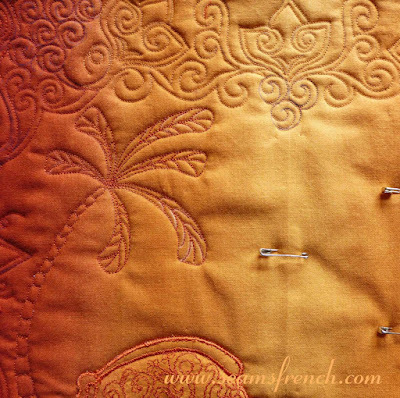 Because of the gradations in the fabric, I used two different colours for the top; an orangy saffron and a rusty red. The Mettler sews up like a much finer thread and it blends into the fabric quite well. 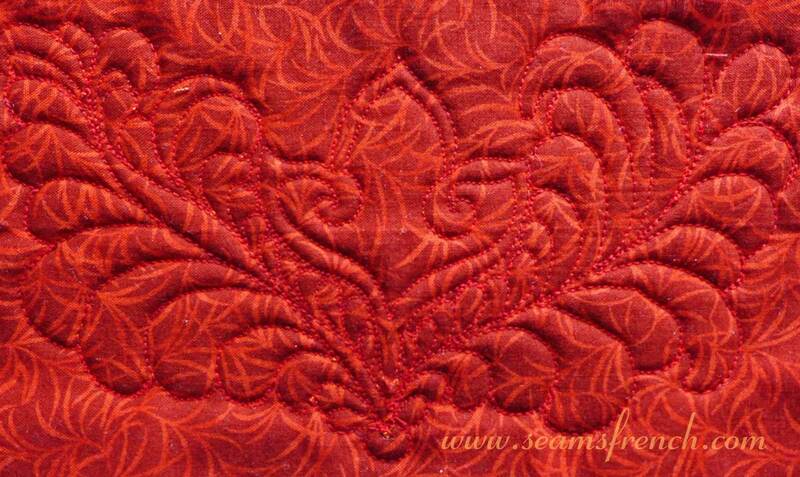 I had not used it for FMQ before this. Top of placemat. 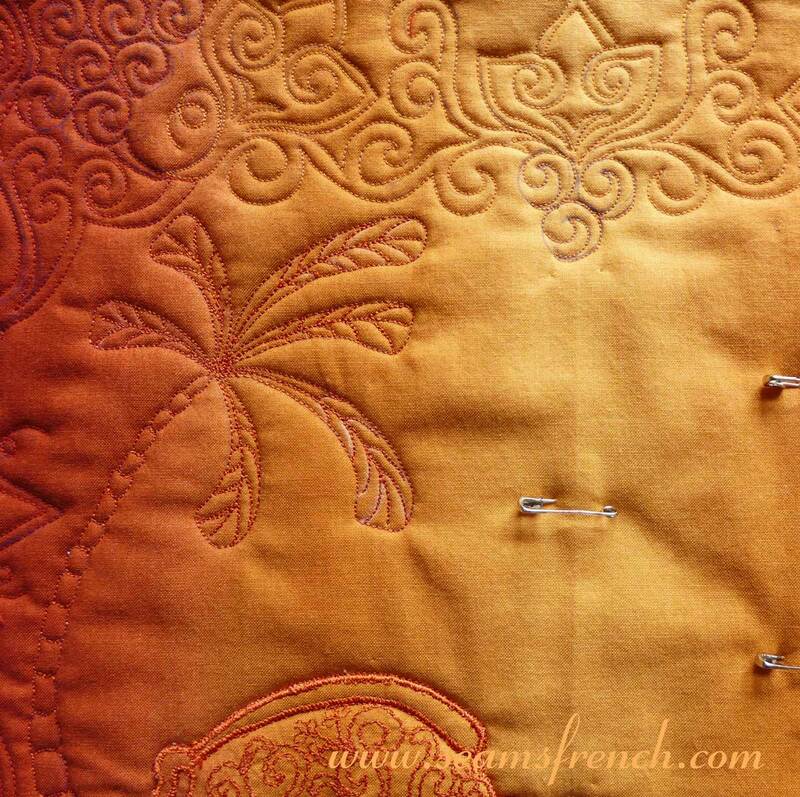 The Sanglier and palm tree were embroidered with Superior's Magnifico (top) and Bottom Line (bobbin). 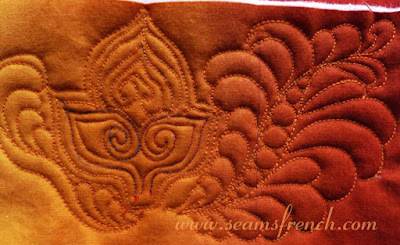 The combination of those two threads worked well with free motion embroidery. 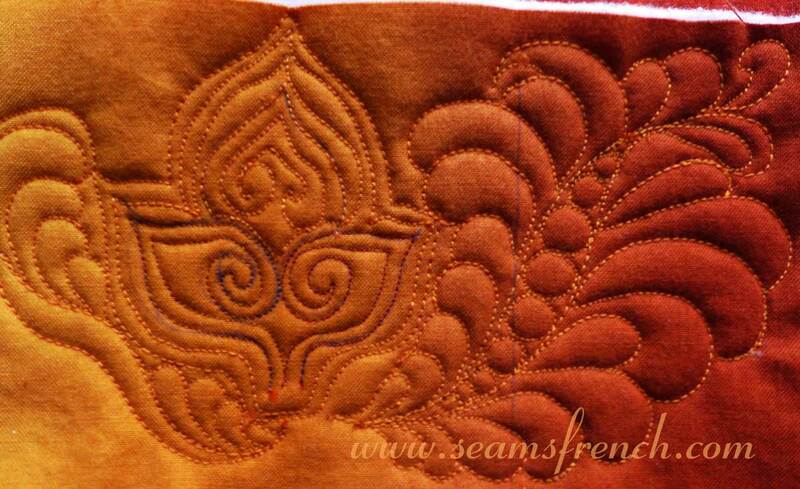 There were no further problems while stitching and the tension issue seemed to disappear almost completely. I quite enjoyed stitching with the Mettler and am happy with the results. As for the happy state of "zen-hood", that may take a while longer. 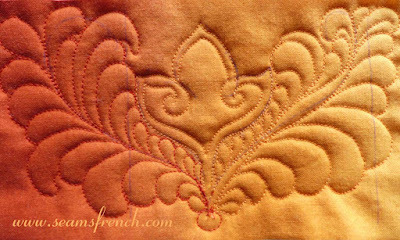 I still prefer the look Superior's Bottom Line creates and will likely go back to it for my next FMQ project, but this time the Mettler and Guttermann did the trick. It is looking so gorgeous! Your care has certainly paid off. You didn't find the Mettler linty? I have some of the cotton and it leaves a little cloud around the needle in a short amount of time. You are right about the Mettler. It is not as "clean" as some of the other threads I use,but in this project it worked a charm. There was excess lint that appeared, but despite that, I liked the way it looked on the finished project. The tension issue is ALWAYS the biggest challenge for me, so when I find a thread that works, I'm willing to give it a try. Wow...what a stressful time finding just the right thing. 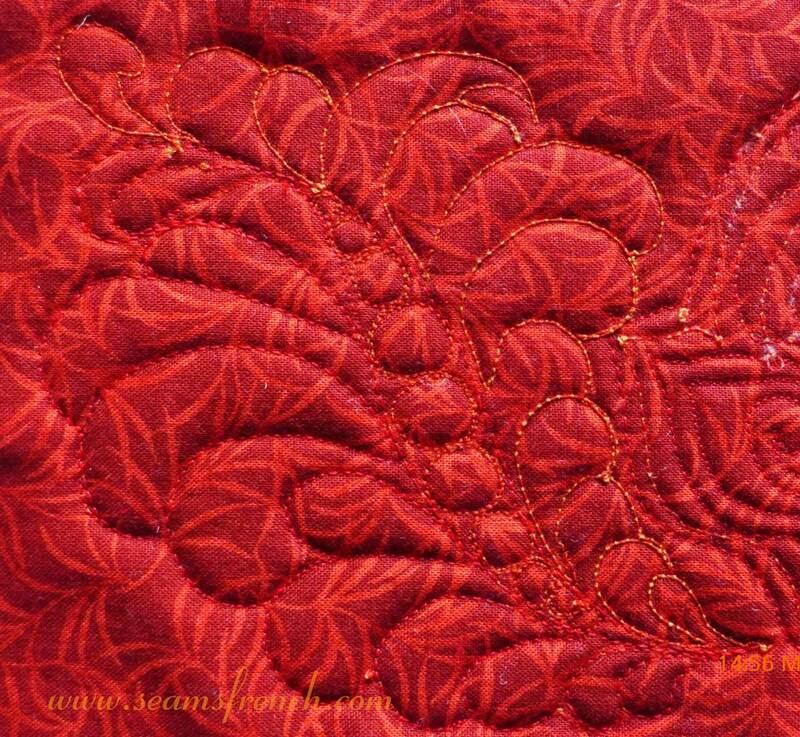 I didn't realize this was part of your beautiful machine quilting. Quite a project! I admire your commitment to finding just the right thing! Beautiful! Thanks Karen. 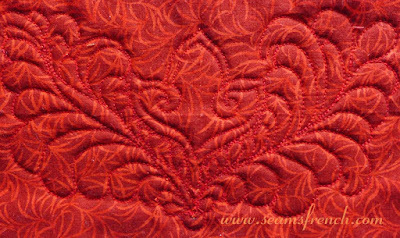 The first few days of quilting a new project are always extremely frustrating, trying to find the right combination of threads and needles. 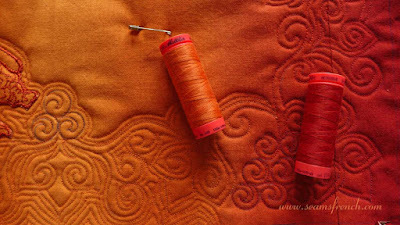 Every project is different, and I have come to realize that the set up time is as important as the actual quilting time. In the long run, it's time well spent.